Last week, after posting Getting Started with REAL Foods, I received several emails with questions about particular steps to take. I also received an encouraging email from a longtime reader, Sara, detailing the steps she took to get started with REAL food after being introduced to Nourishing Traditions. I thought everyone would enjoy hearing her story. 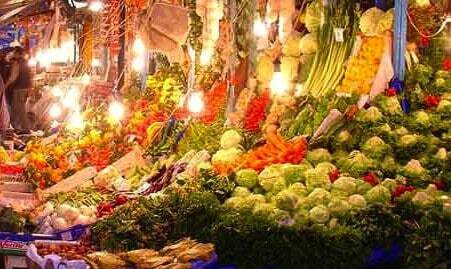 Sara now lives in Turkey and the picture above is of the market where she buys her produce – isn’t it beautiful? … So, there I was, standing in my tiny, cold, corner and crevice-stained kitchen, cooking the only thing I knew how to cook, yet again. It had been a month in our new home and all I knew how to cook was a stir fry recipe I’d gotten from the back of a box of rice. Everything I knew about cooking from growing up in Texas was no help to me in China. I had to learn all over again how to cook everything. Even the rice was different! I was depressed. I just kept cooking the same thing over and over again because the available ingredients were so different! I had no access to butter, no access to cheese… How in the world is a southern girl from Texas supposed to cook anything without butter and cheese??? I was lost. I was seriously depressed for a month! Fast forward one year and I had it DOWN. I learned to strain yogurt (yes, we had plenty of yogurt and milk,) and make something that tasted like sour cream, strain it even longer and I had something akin to cream cheese! I was even helping other ex-pats learn to cook the same yet new foods that we all thought we knew how to cook. I had all kinds of confidence. Then, we moved to Turkey… suddenly I was in a world of dairy products I hadn’t had access to for so long and I was in heaven! I learned even more about using all kinds of new ingredients. Cooking became a hobby. I loved it and I loved that I knew what I was doing! It seemed that everything I was doing in my kitchen was wrong. How I was cooking and what I was cooking was possibly causing health problems within my family! I needed to start over and learn everything yet AGAIN! I decided I had to tackle this slowly. I couldn’t throw everything out and just start from scratch, we didn’t have the money for that. I didn’t have the heart for that. So I started with fats. I used up all of the yellow oil and margarine we had and I never bought it again. I bought only real butter and extra virgin cold pressed olive oil. I used up the rest of our mixes and processed, pre-prepared foods and just didn’t replace them when they ran out. I found recipes to make anything like that I wanted out of fresh ingredients. When we returned to Turkey, I learned new vocabulary to buy the new things I was using. Then I decided to learn how to use one new good food to replace every month. I needed a full month to really learn the new item and know how to use it well. I started with rice. I stopped buying white rice and learned how to use brown. Once I got rice down, I moved on. The next month, I learned how to use whole wheat in place of bleached, all-purpose flour. No, I didn’t start right away with soaking it. I felt I needed to learn how it affected things differently. I knew it would make things more dense and give them a new texture so I wanted to learn how to use it in place of white flour so I’d be better prepared later. I had to take baby steps or I didn’t think I’d have been able to really know what I was doing. Then I had another baby. Since then, I’ve had to put some things on hold. Now that my husband has been diagnosed with an autoimmune disorder, he has decided to start the GAPS diet. So learning to soak flour may be further in the future than I had planned, but since I’ve walked this road as far as I have, it’s making getting into GAPS easier. We have started adding in plenty of probiotics and WOW do they make us feel GOOD!!! Broth is my friend! I can tell you this, while the changes that need to happen are very difficult, not always convenient, and are a little more work, it IS possible. I’ve learned to cook three times now, and I think I’m now able to see more hope than ever that I can supply the healthiest meals for my family possible. I have been able to take several recipes that have been family staples and tweak them so that they are Nourishing Traditions compliant. If you feel overwhelmed, you are not alone. Many of us have felt the same way. But keep moving forward, as “The Robinsons” would say, and take baby steps. Just change one thing at a time and when you are ready and feel confident with it, make another change. Eventually, you’ll look back and have trouble even remembering why you felt so overwhelmed. Sara Warren lives in Istanbul, Turkey, with her husband and three children. When she is not busy caring for her children, she can be found studying Turkish and cooking all kinds of traditional foods. She enjoys singing, playing the piano, learning about history, and making new friends.